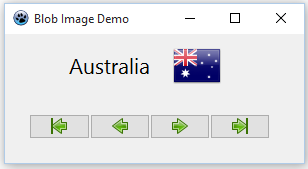 On this page we describe first a console application to create a database containing names of countries and images of their flags and then a form-based application to display the data in DBText and DBImage components. We convert the flag images to long strings, which are then stored as blobs. Interestingly, Wikipedia describes how the BLOB field type was named initially after a film before being given the backronym Binary Large OBject. We create the test database Countries.sqlite by Pascal code, with the help of Yury Plashenkov's example and his source code of SQLite3.pas, SQLite3Utils.pas and SQLite3Wrap.pas. These files are in the project folder together with the flag images used in our TImageList demonstration. This code will also create the required database with Lazarus version 0.9.30.4 on a Raspberry Pi. The code of the unit below the screenshot of the display shows the seven components that we added to the form without any Pascal code of our own. You will see the first country name and flag in the design view of the form when you have linked up the components (using the Object Inspector) with the help of the text view of the form below. Note that this will not work with Lazarus version 0.9.30.4 on the Raspberry Pi. If you need to use a Pi you could adapt our workaround for viewing Firebird blob images by replacing the IBConnection by a SQLite3Connection.